Certain people come into your life and leave a lasting impression. Stan Fisher was that type of person. When I came into the Detroit Fire Department I was assigned to serve my trial period at Engine 10 in the busy 5th Battalion. The place was always full of action from the many fires we fought to the tricks that were played on the trial man. That trial man was me. This firehouse was full of swashbuckling crazy characters led by a gravely voiced Firefighter named Stan Fisher. Those guys helped me learn the firefighting trade. Stan took me into fires, taught me how to survive in an engine house, and most importantly how to conduct myself as a Firefighter. Stan was not only fun to be around but he had an attitude of confidence and integrity that was contagious. Stan had a zest for life that can only be found in people who have faced death many times. I later found out that Stan had been a tank commander serving under General George S. Patton in World War II. Stan helped fight the Nazis in the campaign to retake fortress Europe. He was at the hill overlooking Metz, France when Patton’s armor ran out of gas. They stayed there for many days pounding the Germans with their tanks guns. Stan was also in the rescue column that was sent to save our troops in the battle of the bulge. He had a personal interest in that battle because his brother was part of the American forces that were trapped by the German offensive. In the headlong dash across Germany to end the war, Stan still kept his sense of humor. He told me they would come crashing into a German town with his tank group and immediately go to the bank and shoot open the vault. Next they would find the mayors house and pick up as many souvenirs as they could find. He survived the war and came back with a deep sense of patriotism. 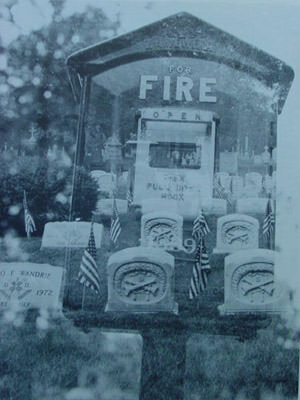 Stan became a great asset to the Detroit Fire Department after the war. He was a member of the honor guard and a member of the department’s clown team. He spent many hours entertaining sick and injured children at local hospitals. When he became a boss he was very protective of his men. I got to know Stan when I was a trial man but I was transferred and did not see him again until the riot in 1967. I was at the command post when Ladder 4 returned from a run where they had been shot at by snipers. Stan came off his rig mad as a bear. He chewed out the dispatcher, the National Guard Commander, and all those attached to security. He demanded a tank so he could personally go back and eliminate the cowards who would shoot at unarmed Firefighters. I remember Stan’s last appearance with the clown team. It was a guest appearance because he had not been active for awhile. It was at the old Tiger Stadium. He had a routine where he was a pitcher and he stood on the mound with a giant baseball glove and a giant hat. He had the fans rolling in the aisles with his crazy antics. My last association with Stan Fisher was when he became Chief 7. I was assigned as his driver. Stan had grown up in the 7th Battalion so we would stop every day to visit his mom for a few minutes as we moved through the Battalion on department business. He loved his family, he loved his job, and he loved his country. Stan never got to enjoy retirement. He died of lung cancer. I for one miss Stan Fisher. He made an impact on my life that made me a better person and a better Firefighter. That smiling face, gravely voice, and flamboyant manner will live forever in the hearts of those who knew him. He was my hero and I will say a prayer for Stan on Memorial day. I know a lot of you Firefighters have a Stan Fisher working in your department. Be sure to shake his hand and thank him for his service this memorial day. Stay safe my brothers and sisters. Photo courtesy of Bill Eisner.